Drew Copeland sits in Stan Lynch's Melrose home, discussing his first solo CD while Lynch - a member of the Rock and Roll Hall of Fame - stands nearby cracking wise and strumming a guitar. 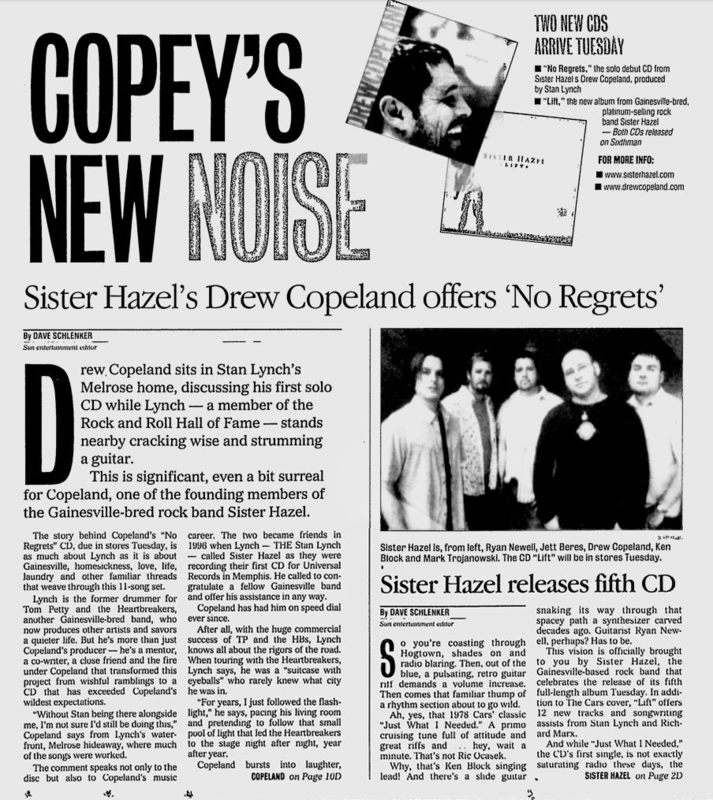 This is significant, even a bit surreal for Copeland, one of the founding members of the Gainesville-bred rock band Sister Hazel. The story behind Copeland's "No Regrets" CD, due in stores Tuesday, is as much about Lynch as it is about Gainesville, homesickness, love, life, laundry and other familiar threads that weave through this 11-song set. Lynch is the former drummer for Tom Petty and the Heartbreakers, another Gainesville-bred band, who now produces other artists and savors a quieter life. But he's more than just Copeland's producer - he's a mentor, a co-writer, a close friend and the fire under Copeland that transformed this project from wishful ramblings to a CD that has exceeded Copeland's wildest expectations. "Without Stan being there alongside me, I'm not sure I'd still be doing this," Copeland says from Lynch's waterfront, Melrose hideaway, where much of the songs were worked. The comment speaks not only to the disc but also to Copeland's music career. The two became friends in 1996 when Lynch - THE Stan Lynch - called Sister Hazel as they were recording their first CD for Universal Records in Memphis. He called to congratulate a fellow Gainesville band and offer his assistance in any way. Copeland has had him on speed dial ever since. After all, with the huge commercial success of TP and the HBs, Lynch knows all about the rigors of the road. When touring with the Heartbreakers, Lynch says, he was a "suitcase with eyeballs" who rarely knew what city he was in. "For years, I just followed the flashlight," he says, pacing his living room and pretending to follow that small pool of light that led the Heartbreakers to the stage night after night, year after year. Copeland bursts into laughter, instantly recognizing that backstage, herd-like shuffle. "Follow the flashlight," "suitcase with eyeballs" - these are among a sea of Stanisms that have nursed Copeland through Sister Hazel's relentless schedule of touring and recording. Copeland has employed Stanisms on many occasions, calling when frustrated over everything from set lists to food backstage. And, to Copeland's surprise, Lynch immediately would recognize each concern and label it as only a seasoned rock star could. "Man," Lynch would say after hearing some road-related problem, "that's a No. 2 with cheese." 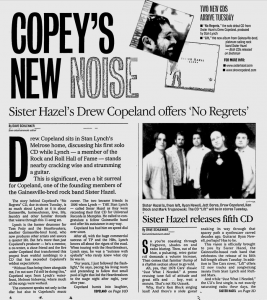 So here they are in the summer of 2004, sitting at a dining room table stacked with turkey subs and soon-to-be-released CDs: Copeland's "No Regrets" and Sister Hazel's "Lift." They cackle and rib each other like old war buddies, and when discussing his solo disc, Copeland keeps coming back to Lynch. This is important, he'll tell you, placing his elbows on the table, locking onto the eyes of visitors and reciting another anecdote about the rock legend he now calls "brother." And, make no mistake, this is important. If not for Lynch, there only would be one disc on that table and it would not be the one proclaiming: "Well, it was out on Paynes Prairie where I got my first kiss." Copeland is the rhythm guitarist and back-up singer for Sister Hazel, and it was Lynch who shoved him front and center. It wasn't easy, quite frankly. Copeland has yearned to record a solo project for years, writing - often with Lynch - when time allowed. Sister Hazel has maintained a relentless touring schedule, most recently fueled by its 2002 disc "Chasing Daylight" and, last year, a DVD and live CD. There's also the band's annual Rock Boat cruise and, new this year, its Rock Slope ski-and-music festival, not to mention writing and recording "Lift." On top of that, the Copeland family was building a new house in Gainesville and expecting a baby (Haven Cerise was born on July 8, joining 5-year-old brother Kellar). All the while, Lynch kept nudging, anxious to help shape that stack of rootsy rock, ballads and pop brewing in Copeland's head. 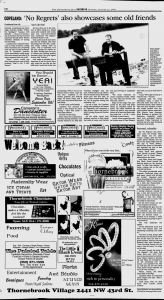 "We wrote whenever we could," Copeland recalls. "Finally, I said, 'Man, let's do this,' and Stan said, 'Amen!' 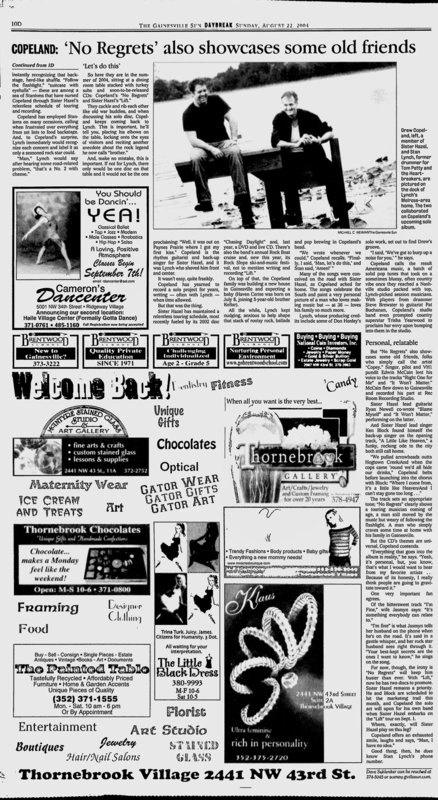 "
Many of the songs were conceived on the road with Sister Hazel, as Copeland ached for home. The songs celebrate the South and paint a very personal picture of a man who loves making music but - at 36 - loves his family so much more. Lynch, whose producing credits include some of Don Henley's solo work, set out to find Drew's groove. "I said, 'We've got to burp up a noise for you,' " he says. Copeland calls the result Americana music, a batch of solid pop tunes that took on a sometimes bluesy, often country vibe once they reached a Nashville studio packed with top, Lynch-picked session musicians. With players from drummer Steve Brewster to guitarist Pat Buchanan, Copeland's studio band even prompted country superstar Trisha Yearwood to proclaim her envy upon bumping into them in the studio. But "No Regrets" also showcases some old friends, folks who simply call the artist "Copey." Singer, pilot and VH1 pundit Edwin McCain lent his voice to the tracks "Right One for Me" and "It Won't Matter." McCain flew down to Gainesville and recorded his part at Rec Room Recording Studio. Sister Hazel lead guitarist Ryan Newell co-wrote "Blame Myself" and "It Won't Matter," performing on the latter. And Sister Hazel lead singer Ken Block found himself the back-up singer on the opening track, "A Little Like Heaven," a funky, rocking ode to the city both still call home. "We pulled arrowheads outta Hogtown Creek/And when the cops came 'round we'd all hide our drinks," Copeland belts before launching into the chorus with Block: "Where I come from, it's a little like Heaven/And I can't stay gone too long . . ."
The track sets an appropriate tone; "No Regrets" clearly shows a touring musician coming of age, a man still moved by the music but weary of following the flashlight. A man who simply craves some time at home with his family in Gainesville. But the CD's themes are universal, Copeland contends. "Everything that goes into the album is reality," he says. "Yeah, it's personal, but, you know, that's what I would want to hear from my favorite artists . . . Because of its honesty, I really think people are going to gravitate toward it." One very important fan agrees. Of the bittersweet track "I'm Fine," wife Jasmyn says: "It's something everybody can relate to." "I'm fine" is what Jasmyn tells her husband on the phone when he's on the road. It's said in a gentle whisper, and her rock star husband sees right through it. "Your best-kept secrets are the ones I want to know," he sings on the song. For now, though, the irony is "No Regrets" will keep him busier than ever. With "Lift," now he has two discs to promote. Sister Hazel remains a priority. He and Block are scheduled to hit the marketing trail this month, and Copeland the solo act will open for his own band when Sister Hazel embarks on the "Lift" tour on Sept. 1. Where, exactly, will Sister Hazel play on this leg? Copeland offers an exhausted smile, laughs and says, "Man, I have no idea." Good thing, then, he does know Stan Lynch's phone number.